When a mysterious benefactor offers to make her his ward, a destitute Sabrina Wilder journeys south to New Orleans, suspicious as she is of this unexplained generosity. She is, at first, delighted with the sensual climate of the city, with its spice-laden trade winds and with the beautiful antebellum mansion at Beelfontaine. But an ominous thread soon emerges. Why does Abijah Bailey, the handsome family lawyer, accuse her of being an adventuress? And what of the eerie rites of Delzinde, the High Voodoo Priestess? 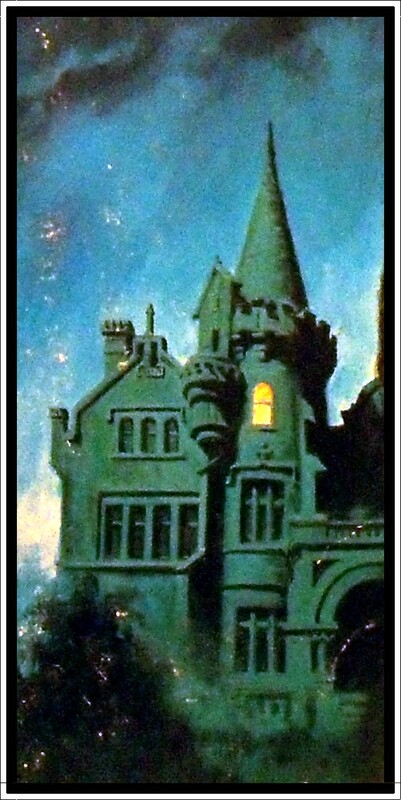 Moreover why are the elegant halls of Beelfontaine hung with corpses that only Sabrina can see? The horror becomes rampant at Mardi Gras, as frenzied mummers drop their masks to reveal themselves as the Devil’s helpers sent to sacrifice Sabrina in a ghastly Satanic ritual! Written by Saliee O’Brien. 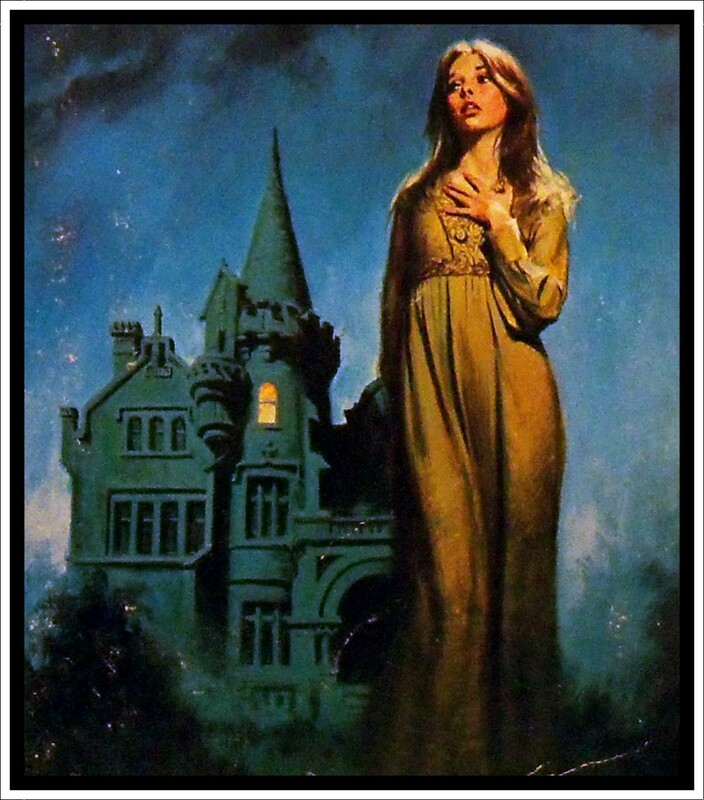 This Berkley Medallion Edition, August 1974. Cover art John Duillo. Oh, I couldn’t resist the back blurb on this one. Either our heroine has found herself enmeshed in an orgiastic quagmire of voodoo and black magic, or someone’s slipped a little something into her Mint Julep and she’s woken up in the middle of a particularly bad acid trip. 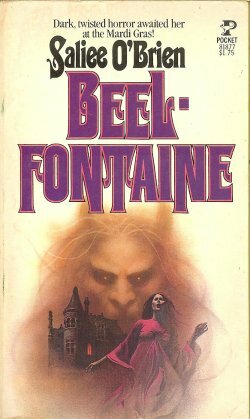 Whatever her fate, I had to find out and so Beelfontaine went straight to the top of my weekend reading pile. The story opens on a rain-lashed night in March 1872. Sabrina, accompanied by her little brother Frankie and elderly cousin Massie, are fresh off the steamboat from Salem and standing outside their new home in New Orleans. The last few months have not been kind to this unfortunate trio but help is at hand in the guise of a mysterious benefactor – Pierre Beelfontaine. Monsieur Beelfontaine has a son but he wants a daughter. Since his wife has died, he needs to find one from someone else’s family, preferably someone descended from witches. He has studied Sabrina’s family tree and is well aware her parents have died, leaving her destitute with a sickly brother desperately in need of medical care. Having apprised himself of Sabrina’s breeding, not to mention her sound mind and beauty, he has decided to offer his home to her as well as a sizeable allowance. However, on arrival at Beelfontaine Manor, Sabrina is greeted by an unwelcome hulk of a house inhabited by a resentful, vengeful mob – and that’s just the servants. The family all hate her too, in fact no-one, apart from Pierre Beelfontaine and his son Antoine, wants her there and it’s not long before Sabrina finds herself victim to all manor of unfortunate ‘accidents’. She knows someone is out to kill her but who and why? Curiosity overrides self preservation and so she decides to stay to find out, resignedly putting up with all the voodoo dolls left swinging from her bedroom ceiling, the drugged nightcaps and hateful glances at her fiery red hair. Sooner or later, she tells herself, her unknown enemy will give themselves away. In the meantime, Pierre Beelfontaine finally reveals the real reason why she is here. He wants her to marry his son and give him a grand-son. His son, Antoine with the mesmerising golden eyes, promptly declares his love for Sabrina before presenting her with a beautiful diamond and pearl necklace – a precious family heirloom known as the Pearls of Beelzebub. Sabrina is rendered speechless – by both the sudden proposal and the stunning gift. Being a pragmatic lass, she maintains her diplomatic silence while she retires to her room (still wearing the necklace) to weigh up her options. On the one hand, we have learnt the necklace is cursed – by the blood of the women slain for the beautiful pearls and diamonds that adorn it. But… it is a beautiful necklace. And though marriage to Antoine seems a little hasty, what other prospects has she got? Sabrina’s mind is soon made up for her, when she awakes in the dead of night to the sounds of drums and chanting, her little brother Frankie gone from his bed. In desperation (and still wearing the necklace) she runs from the house in the direction of this barbarous cacophony to find herself in the midst of a horrifying Voodoo ritual. Even more terrifying, it looks as if her little brother is next in line to be sacrificed. Oo-er. 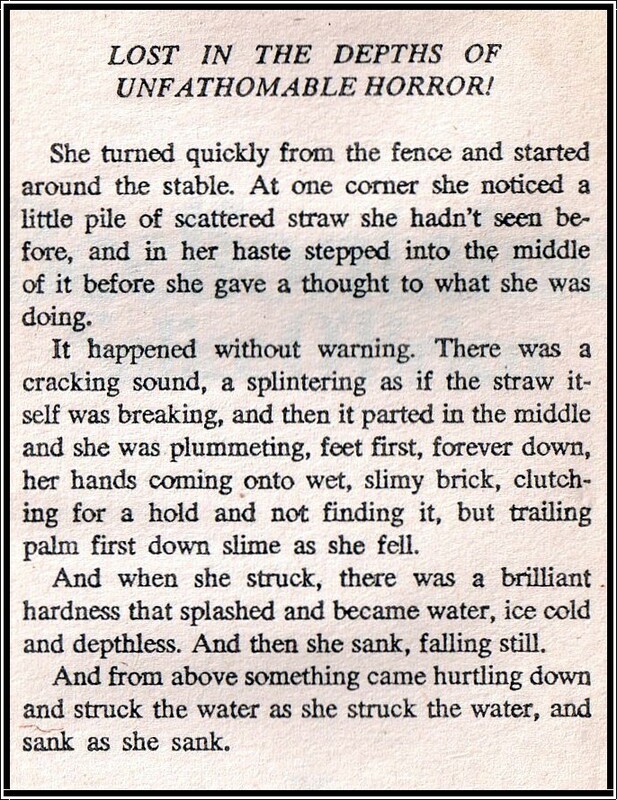 It seems our heroine really has found herself enmeshed in an orgiastic quagmire of voodoo and black magic. Before she can scream for Dixie, she is stripped by a congregation of frenzied slaves desperate to spill her pure virgin blood in order to appease their angry gods. Sabrina only just manages to escape, running naked (though still wearing the pearls) and terrified straight into the arms of her husband-to-be Antoine. His response to her dilemma is to insist she marries him right away – marriage into the Beelfontaine family being the only way to guarantee her safety. Typical of gothics from this time, the religion of Voodoo gets used and confused alongside Satanism, which doesn’t always work for me, but I can more than forgive Beelfontaine this for its amazing ‘Satan Soul’ plot line and the author’s liberal use of twisted lusts and demonic pacts. To say just about every character in this book had a complicated love life with a strange tale to tell would be putting things very mildly. 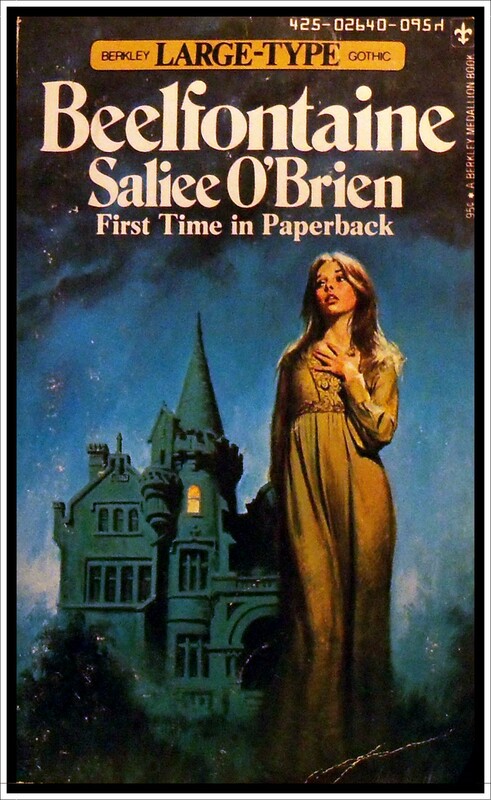 I’m not sure if Saliee O’Brien wrote any more gothics – though The Bride of Gaylord Hall looks and sounds promising – but I hope so as I’d certainly like to read more! Four out of five stars.